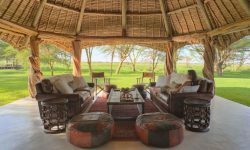 Sirikoi is a family- run award winning eco lodge surrounded by beauty of the Lewa Wildlife Conservancy on the Northern slopes of Mount Kenya. The Lewa Wildlife Conservancy has abundance of endangered wildlife such as the Black Rhino, White Rhino and Grevy’s Zebra. The Lodge offers comfort, world class gourmet food with a relaxed atmosphere. The area is Malaria free and had a beautiful spring like climate all year round. Luxury Tented Rooms offer beautiful views across the lawns towards the waterhole. 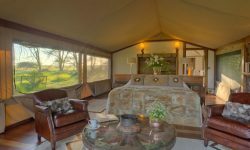 Sirikoi’s four Luxury Tented rooms are perfectly positioned to make the most of ‘armchair’ game viewing. Each tented room has a outside deck, large double beds, fireplace for the chilling nights, en-suite bathrooms. The Sirikoi Cottage has been designed with families and friends in mind. It can be taken as a completely private and separate unit it as a extension to the main lodge. The cottage has 2 bedrooms with en – suite bathrooms, each of which has an extension of the main lodge. 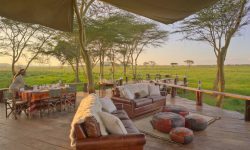 A shared central area and a small kitchen links to the bedrooms and out to the spacious deck overlooking the waterhole. Sirikoi House is the grandest of the Sirikoi accommodation options. The house complex includes master bedrooms cottage, a separate bedroom cottage with 2 en-suite bedrooms and central living and dining cottage that has become renowned for its unique décor. Guests have access to private decks outside overlooking the water hole. The house is sold as a exclusive use only basis with its own private guides and vehicles as well as a chef and a team of staff.